After installing a high-flow intake, exhaust and air-to-air intercooler on my (now sold) Holden VL Turbo, my next move was to bump up the boost pressure. To achieve an increase from 50 to 90 kPa, I tested two similarly cheap methods of fooling the wastegate actuator - an aftermarket bleed valve and a general-purpose pressure regulator. The particular valves I tested were the $99 PowerUp MBC (bleed) and an IMI Norgren Pty. Ltd. Regulator (part number R07-200-RNKG Inline 07 ¼ Regulator Relieving 7Bar). In addition to the regulator valve, I also needed to swap to a light-duty internal spring (part number 2069-02 07 Spring 0.7 Bar brown) and screw in a pair of ¼-inch BSP barbed fittings (part number 291170628). The total cost for the regulator set-up is around $40. You may have recognised the Norgren regulator from a previous boost-up article on AutoSpeed - it was used on an Audi S4 in the story " The Audi's DIY Boost Control - Part 1". It's important to note, however, the Audi system also used a separate pressure relief valve as part of the control strategy - this enabled the fastest possible boost rise to a user definable point, after which the regulator stepped in to enforce the maximum boost pressure. The rate of boost pressure increase was not controlled by the regulator - it only started working when near full boost was already being developed. In the instance of my VL Turbo, we did our testing without the pressure relief valve - we only wanted to see how stable the regulator-controlled peak boost level was in comparison to the bleed. Installing the one-piece bleed was simple - the already slightly lengthened hose between the compressor outlet and wastegate actuator was cut and the valve was inserted inline (making sure the valve's specified flow direction was followed). Then, as always when tampering with high-pressure hoses, the fittings were securely clamped to prevent a hose popping off under boost - and potentially destroying the engine. The valve's adjustment dial was twiddled to deliver my maximum desired boost level of 90 kPa; this was achieved at maximum load in top gear climbing a hill. As seen in this graph, the extremely high engine load in top gear saw manifold pressure rocket up to 90 kPa at a mere 2000 rpm. After this initial spool-up spike, however, manifold pressure stabilised at a lower 80 kPa. 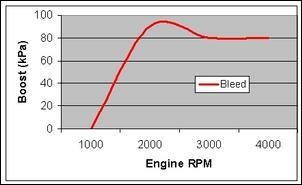 Accelerating in second gear the bleed valve gave the same fundamental boost characteristics - but at lower values. We saw a fast boost spike to 85 kPa, dropping off to hold 70 kPa at higher revs. 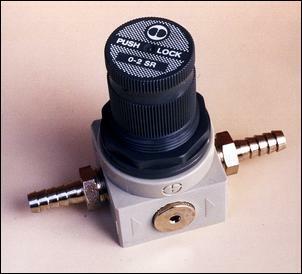 The PowerUp bleed valve was disconnected and in its place went the Norgren pressure regulator (complete with its appropriate spring and barbed fittings installed). 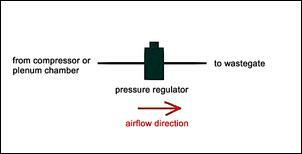 Like the MBC bleed valve, the regulator must also be oriented to suit a particular flow direction. 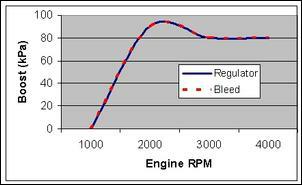 In second gear, however, the regulator system performed very differently to the bleed system... Peak boost in second was down to just 67 kPa and we found only 60 kPa pressure held to redline. 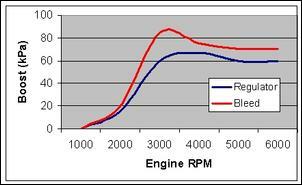 That means the maximum attainable boost pressure in second gear was some 26 percent less than we'd seen in top gear! 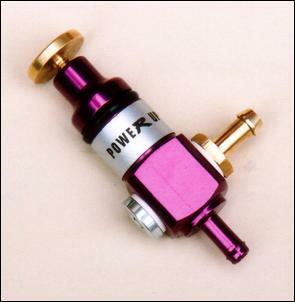 Furthermore, peak boost was attained 1000 rpm later than when using the bleed - as expected, the regulator was certainly holding back the rate of boost rise. Neither the bleed nor regulator boost control systems give consistent boost pressure across varying load and rpm ranges - not in the case of my VL Turbo, anyhow. 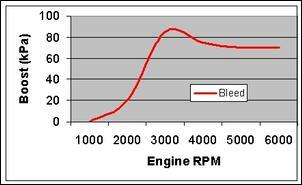 We weren't surprised to see considerable pressure variation when using the bleed - as I said earlier, a bleed is a relatively imprecise method of controlling wastegate pressure. In the worst case, the bleed resulted in up to 22 percent boost pressure variation (22 percent, by the way, is more than enough for someone to inadvertently lean-out and damage their car's engine). If the 22 percent variation we'd seen using the bleed was bad, it was nothing compared to the 33 percent maximum variation we saw using the regulator! Well - as much as I hate to say it - the only sure-fire way to be certain that your maximum desired boost pressure will be stable is to use a complex boost control system that employs a closed feedback loop.